On my kitchen counter I have a large cake plate with a glass dome over it, and most of the time it's filled with muffins or a quick bread. Last week I wanted to bake something that would still be perfect to add to breakfast, but that wasn't as sweet as the muffins I typically bake. 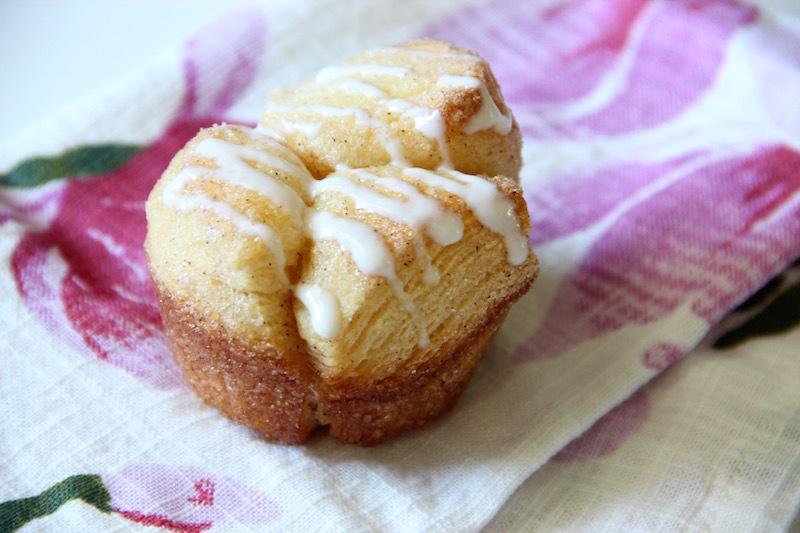 I threw together these cinnamon sugar pull-apart muffins in no time. The dough is biscuit dough, so it's not as sweet, and each piece of dough is rolled in a little bit of cinnamon and sugar. Once baked, the muffins are drizzled with a little bit of frosting - but! I swapped out the cream cheese for Greek yogurt instead! The vanilla in the Greek yogurt really comes through and makes for a delicious frosting. I can't wait to see what else I can make with this frosting hack. You can find other #madewithchobani recipes here. Heat oven to 350 degrees. Lightly grease 12-cup muffin tin with non-stick cooking spray. To make the frosting, whisk together the Greek yogurt and the powdered sugar, making sure no lumps remain. Place in refrigerator until ready to use. In a shallow bowl, stir together the granulated sugar and the cinnamon until well combined. Separate dough into eight biscuits; cut into quarters. Toss each piece of dough into the cinnamon sugar mixture. Place 3-4 pieces of coated dough into each cup of the prepared muffin tin. Bake for 14-18 minutes, or until top is golden brown and dough is cooked through. Remove muffins from muffin tin and place on wire rack. Drizzle desired amount of frosting over the warm muffins. Serve immediately. Makes 8-10 muffins.